Kolkata Knight Riders (KKR) are all ready to face Rajasthan Royals (RR) in the match no 21 of VIVO Indian Premier League (IPL), 2019. The match will take place at Sawai Mansingh Stadium, which is Rajasthan home ground. Ahead of RR vs KKR, former Indian Cricket team skipper Kapil Dev praised Kolkata batsman Andre Russell for taking power-hitting to another level. Rajasthan Royals vs Kolkata Knight Riders Live Cricket Score 21th T20 Match. 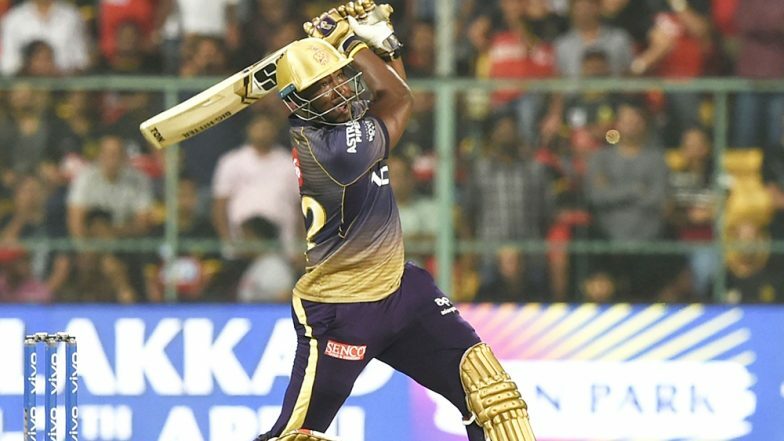 Andre Russell in his previous match against Royal Challengers Bangalore (RCB) played an unbeaten knock of 48 runs from 13 balls, where KKR won the match by 5 wickets. Kolkata team chased down a total of 205 with 5 balls to spare. RR vs KKR, IPL 2019 Match 21, Key Players: Andre Russell to Jos Buttler to Jofra Archer, These Cricketers Are to Watch Out for at Sawai Mansingh Stadium. Andre Russell is known as Muscle Russell because of the huge massive sixes which he hits. This KKR all-rounder is indeed the most valuable player of this IPL season. Russell also guided KKR to victory by his monstrous batting against Sunrisers Hyderabad in their opening game of IPL 2019 where he scored 49(19). He also played a quick cameo of 48(17) to help Kolkata post a total of 218/4 against Kings XI Punjab (KXIP). Kolkata Knight Riders will be hoping for their Carribean batsman to explode again when they play against Rajasthan in the game no 21 of IPL 12. KKR has 6 points to their name till now, currently Chennai Super Kings (CSK) is currently on the top pf point table with 8 points.